When we ride we are constantly confronted with situations that usually turn out to be of no consequence. After awhile, having seen it before and never having been negatively impacted, we tend to believe that we can handle just about anything and that *THIS* situation is just like all those that preceded it - just another 'no big deal'. I do not mean to be so fatalistic with this post as to discourage riding altogether. Rather, I intend to restore those earlier caution/warning/danger signals back to reality for you. My advice: Always assume the worst will happen and plan accordingly. So what if you turn out to be wrong? You lived another day and aside from burdening yourself with some defensive efforts that ultimately proved to be unnecessary, the ride was enjoyable. 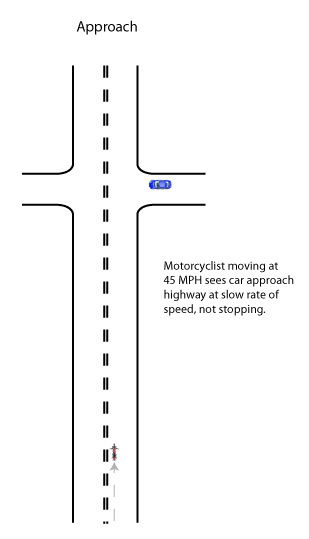 Here we see that while you are traveling on the 'main drag' (essentially a highway city street) at 45 MPH, in the distance there is a minor intersection with a car approaching that intersection at a slow rate of speed. With virtual certainty that car driver is approaching a stop sign. You assess that there is no 'real' threat at this time. The car can stop, or not. But in any event, you have lots of time and distance available to you for use in either stopping or slowing to avoid that car. I believe that almost everyone who is a regular reader here would choose the last option, as would I. There is no threat to have to deal with immediately, but as a defensive driver, you assume the worst, that the car may not stop and so you cover your brake lever to be able to react as quickly as possible, 'just in case'. A few moments later you observe that the car is not stopping. It continues at a slow speed and enters the intersection. At this time you assess the situation as a possible threat - though of relatively low odds. Even if the car continues to cross the intersection at a slow rate of speed, it is not going to become a collision event. 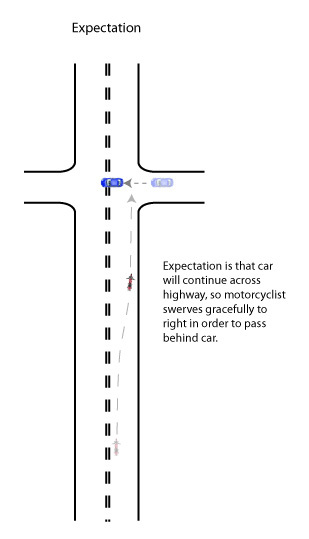 You have lots of time and distance to react in such a way as to avoid a collision. 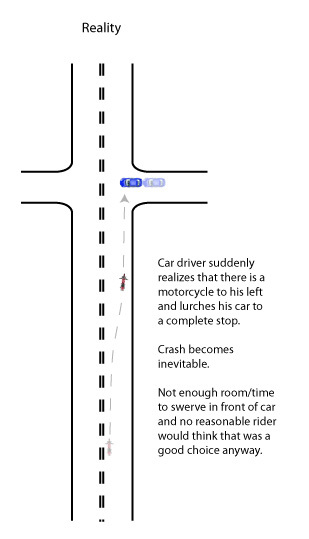 But your expectations failed to consider the worst possible outcome - that the driver of that car might actually stop in the intersection when he suddenly wakes up to the fact that your motorcycle exists and is heading straight for him! That non-threatening situation has just become life or death. Why? Because you didn't expect the worst and plan accordingly. Do so and you continue your ride without incident other than a brief expenditure of evasive effort along the way. Expect the worst, and plan accordingly! If you bet (have expectations) on something other than the worst, you can lose. But if you bet on the worst, and plan accordingly, if those expectations are met, OR NOT, you win!